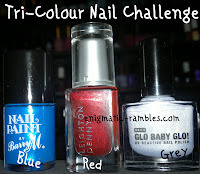 These are the three polishes which are to be used for these challenges. Expect to see three more for this month. 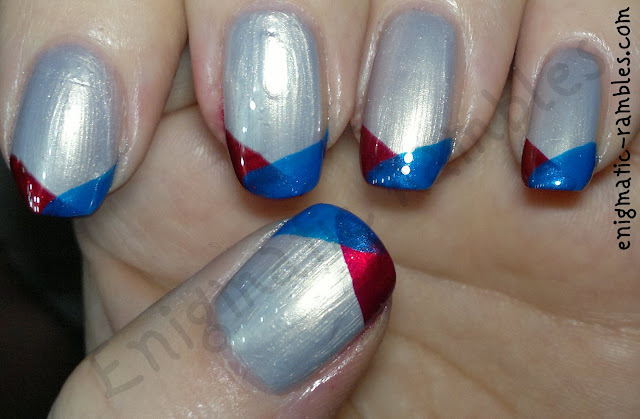 Barry M's retro Blue (2), Leighton Denny's Be My Berry which is the perfect christmas red and finally Primark's Glo Baby Glo! Which I'm not really a fan of to be fair, bit streaky. Simple but brilliant! Weirdly, they remind me of...Camelot, or Medieval times or something! This is great! It's so simple yet eyecatching.